Duttaphrynus melanostictus is called the Asian common toad, Indian toad or Black-Spined Toad. It occurs very widely in south and south-east Asia, from Pakistan all the way to Indonesia. These toads occur in a variety of habitats, including forests, gardens and urban areas where they can enter homes. I took these photos in a restaurant in southern Thailand; the toad was under the table! They feed on a wide range of invertebrates, even consuming scorpions, and can grown quite large (up to 8 inches). They breed during the rainy season, and the females produce a huge number of eggs (e.g. 40,000) which are laid in ponds of streams. The colours of this toad seem to be highly variable (brown, grey, reddish or yellow), but it is probably a species complex, or a group consisting of more than one species. Despite the variation however, there are a number of characteristic features. Firstly, a series of bony ridges: along the edge of the snout; in front of, above and behind the eye, and between the eye and ear. Secondly, the parotoid glands – kidney-shaped swellings behind the eyes have a network of characteristic black markings (see below). Thirdly, one or more black spots on the prominent warts which occur all over the body. The ear drum is also very distinctive and in size, is always least as wide as two-thirds of the diameter of the eye. 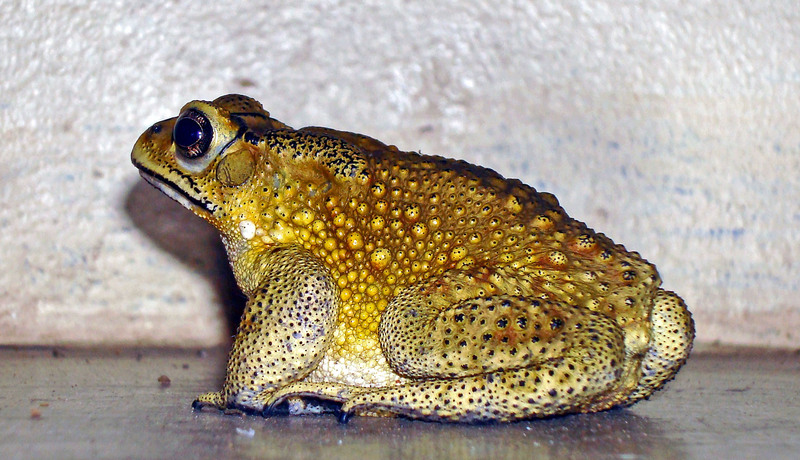 This species is a typical Bufo type toad (Anura : Bufonidae) containing poisonous secretion both in large parotoid gland as well as in numerous warts on the skin. 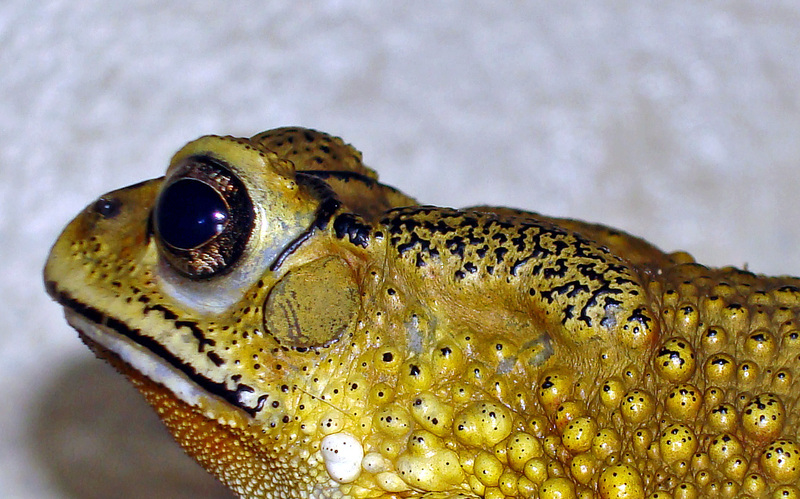 The milky white secretions of the parotoid glands of some toads – particularly the cane toad – can produce seizures and death, for example in dogs or cats which have tried to bite or swallow them. Humans should wash their hands after handling toads! 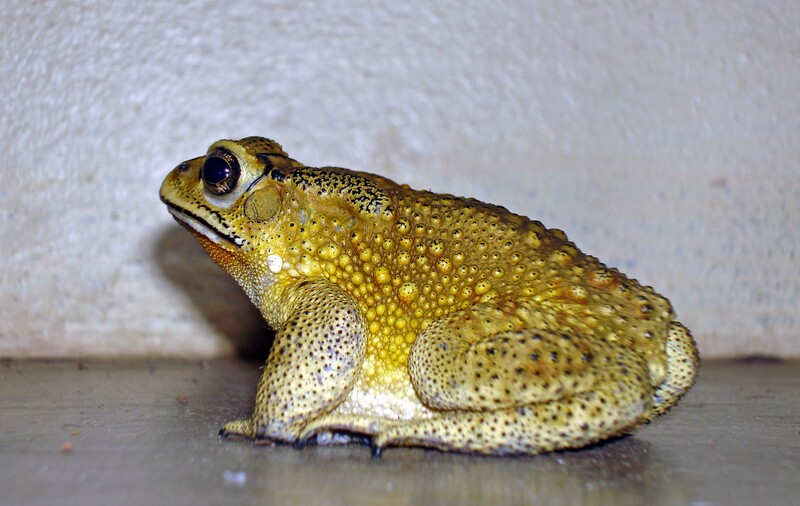 The toxins themselves are called bufadienolides (bufogenins and bufotoxins) and their effects are not pleasant but are used to protect the toad from predators and infections. This toad is a potentially invasive species and can become a pest if introduced into areas outside of its natural range (2). Previous Previous post: A small frog with a big voice!